Russian President Putin did not agree to a possible deployment of peacekeepers in eastern Ukraine, his spokesman said in response to Kiev’s claims to the contrary. Moscow insists that all points of the Minsk agreement are fulfilled first. He added that Russia believes that any peacekeeper deployment would be relevant only after all points of the Minsk agreement are fully implemented and suggested that the OSCE - as the leading security institution involved in tackling the Ukrainian crisis - should be given priority in the mission. The Minsk agreement was negotiated by the Normandy Four and signed by representatives of Kiev and the rebels in February in the Belarusian capital. It paved the wave for a shaky ceasefire and pullout of heavy weapons from the engagement line. However, both the rebels and the Ukrainian government accuse each other of derailing the agreement through ceasefire violations and failure to follow the roadmap. Kiev insists that local elections are held in the dissenting areas and demands that Russian troops and weapons withdraw from it. The rebels say their opponents are failing to stop an economic blockade, while Moscow denies having any troops in Ukraine in the first place. 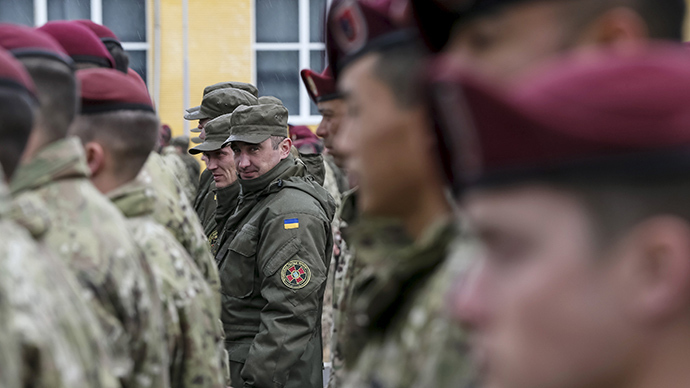 Deploying EU peacekeepers to monitor the ceasefire is an idea strongly advocated by Kiev. Rebel leaders voiced conflicting positions on the issue while the Europeans demonstrated reluctance to contribute their soldiers to such a mission amid the continued violence.